The Sprint Cup Series returns to Pocono Raceway with the Camping World Truck Series in tow, while the Nationwide Series makes its second stop of the season at Iowa Speedway. When the Cup drivers last descended on Pocono, Joey Logano quickly mastered the 2.5-mile track's new surface. Can he make it a sweep? The Camping World Truck Series returns for its third annual race at Pocono. Kevin Harvick Inc. dominated the first two races, with Elliott Sadler winning the inaugural event in 2010 and Kevin Harvick winning last year. With the organization out of the picture, who'll conquer the Tricky Triangle? The Nationwide Series returns to fan favorite Iowa Speedway. Series champion Ricky Stenhouse Jr. has won the last three races here; can he make it four in a row? Pocono Raceway, Long Pond, Pa.
Spring 2012: Ricky Stenhouse Jr.
Fall 2011: Ricky Stenhouse Jr. The following is a schedule of track events and TV coverage this weekend at Pocono and Iowa. All times are in Eastern Standard Time. Events without a channel listed will not be televised. 1 p.m. NCWTS: Pocono Mountains 125, SPEED. Green flag: 1:21 p.m.
8 p.m. NNS: US Cellular® 250 presented by the Enlist™ Weed Control System, ESPN2. Green flag: 8:15 p.m.
3 a.m. NNS: US Cellular® 250 presented by the Enlist™ Weed Control System (re-air), ESPN2. 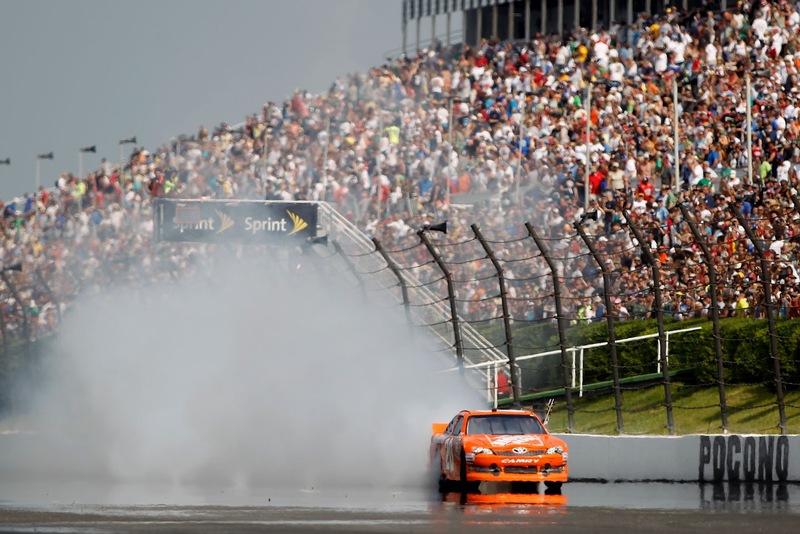 1 p.m. NSCS: Pennsylvania 400, ESPN. Green flag: 1:19 p.m. Reruns at midnight on ESPN2.